If you've noticed the polls that are located on the right side of this blog, you'll see that the two on the bottom have closed. I have the results of the boy poll here! I will feature the girl's poll on Thursday. Looking back on this, I would have probably preferred to remove one of them and include Arthur or Frederick. 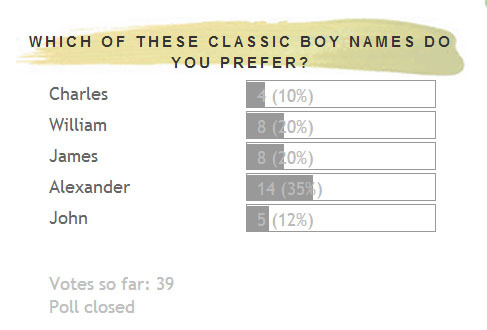 Nonetheless, you guys voted and the clear winner was Alexander. Alexander is a Greek name meaning "Defender of the People," and it is also my favorite on this list. It is the name I chose for my son's middle name. It ranked at #9 on the 2012 US Top 1000 Names chart! It is a noble name with many nicknames and variations such as Alex, Lex, Xander/Zander and even the exotic Sasha. There was a two-way tie for second place, William and James. William is a royal name, currently used by Prince William. This is a classic name that has endured over the years. It currently sits at #5! It is both conservative and contemporary with the cute, popular nickname Liam (which ranked #6 on its own.) Despite Liam, there will continue to be Wills and Bills and Billys. William is an English name meaning "resolute protection." James is considered the English variation of Jacob, but it is also known as a Hebrew name meaning "supplanter." This name has also endured time and remains as popular and stylish as ever! It ranks at #14 and is beloved by many for its extensive history and cute nicknames like Jimmy and Jamie. There are also many interesting foreign variations of the name from Jacques to Hamish to Seamus. John is a solid classic that stood at the top of the list for decades. In fact, before the SSA began compiling data in 1880, John was the most popular name for nearly 400 years! While it ranked at #28 last year, many parents view it was overused, opting for Jack or another international variation such as Jean, Sean, Ian, Evan or Ewan. The ones that use John today seem to use it to honor a relative rather than using it for stylistic reasons. It is at its lowest point ever right now. It is a Hebrew name meaning "God is gracious," and despite its drop in popularity, I imagine it will always be in the Top 100. Lastly, Charles only got 4 votes. The name dates back to Charles the Great or the emperor Charlemagne. It is an elegant royal name that is currently in usage by Prince Charles, son of Queen Elizabeth and first in line to the throne of England. It has also been the name of Kings in France, Spain, Portugal and Hungary. It ranks at #62 in the US and is a French name meaning "free man." 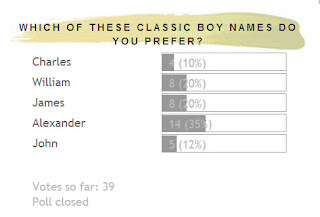 It seems many parents prefer the nickname Charlie as a given name. Which of these names did you vote for? What are your favorite nicknames for each? Let me know in the comments below! And stay tuned for the results of the girl's name poll! It will post on Thursday! The Prince of Cambridge Has A Name! The Prince Has Left The Building! The Royal Baby is Finally Here!